A team of Iranian and German archaeologists is currently excavating the Gohar-Tappeh prehistoric mound in the northern Iranian province of Mazandaran for anthropological studies. The lifestyles of people in Gohar-Tappeh in various periods will be studied, team director Ali Mahforuzi told the Persian service of ISNA on Saturday. He said that the German experts have been invited to this season of excavation based on a contract signed between the University of Munich and the Iranian Center for Archaeological Research (ICAR). The team began the excavation around late August. “This site was identified during an archaeological excavation in 2000 and eight seasons of excavation have previously been carried out there,” he added. Due to the lack of funds, the studies have focused only on the northern part of Gohar-Tappeh, he stated. Contract talks between the ICAR and the University of Munich were carried out in 2009. Based on the agreement, the university agreed to conduct and finance part of the research and experiments. Gohar-Tappeh is located 10 kilometers west of the town of Behshahr. A large number of graves and artifacts has been discovered during the previous seasons of excavation. “This site seems to have developed into a large city about 4500 years ago. However, it was abandoned some 1000 years later due to a major climate change and for other reasons,” Mahforuzi said. Mahforuzi’s team had previously unearthed a cobble-stoned lane at Gohar-Tappeh during the fifth phase of excavations in 2006. 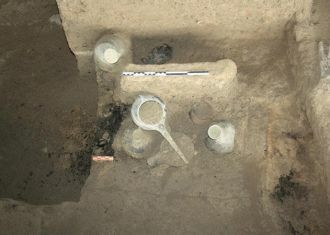 The archaeologists also discovered an artifact, which was identified as a clarinet, in a grave beside a skeleton. They also unearthed dice for playing the game of craps at the site.